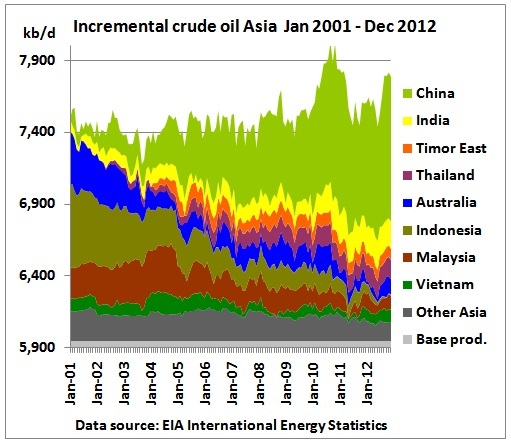 Excluding the US, rest-of-world crude oil production in the 2nd half of 2012 was on the same level as in the 2nd half of 2005, despite 85% higher oil prices. There are many reasons for this. 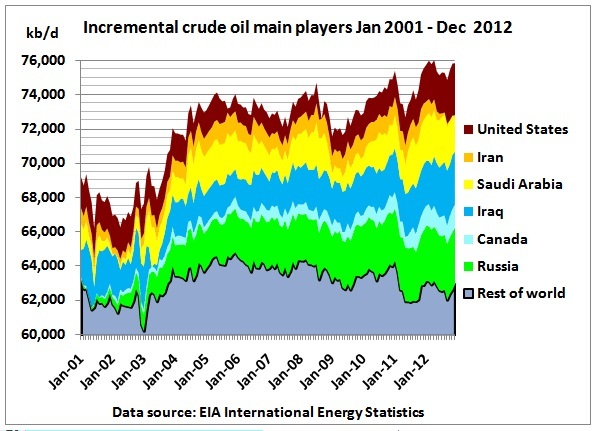 Declining oil production in many countries which cancelled out growth elsewhere. 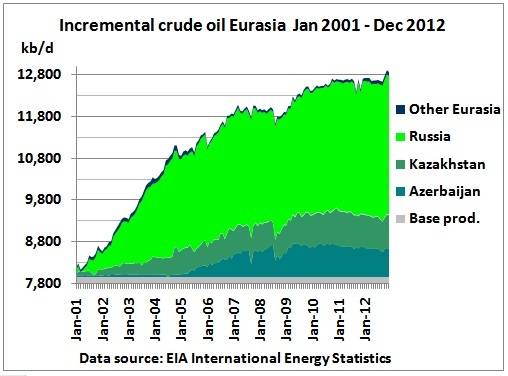 The 2nd Russian oil peak petering out. Saudi Arabia’s swing role response to US shale oil. 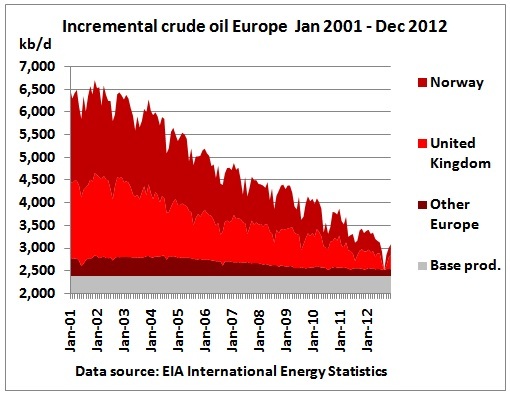 Financial crises impacting on oil demand. 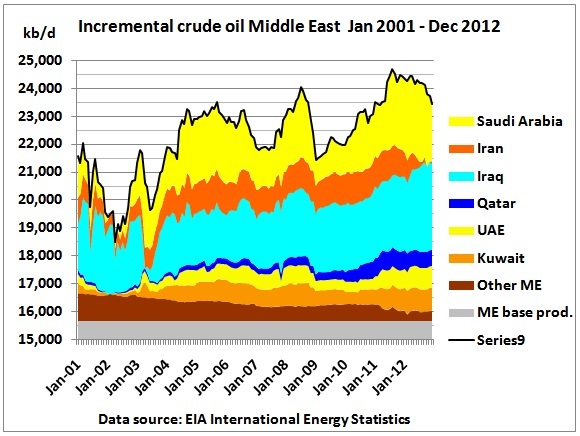 High investment costs in the oil sector to keep production going. Geopolitics around Iran. Oil wars and civil unrest in Iraq, Libya, Sudan, Yemen and Syria. Hurricanes impacting on offshore oil. Altogether, there simply were (and still are) too many problems, often one after the other. 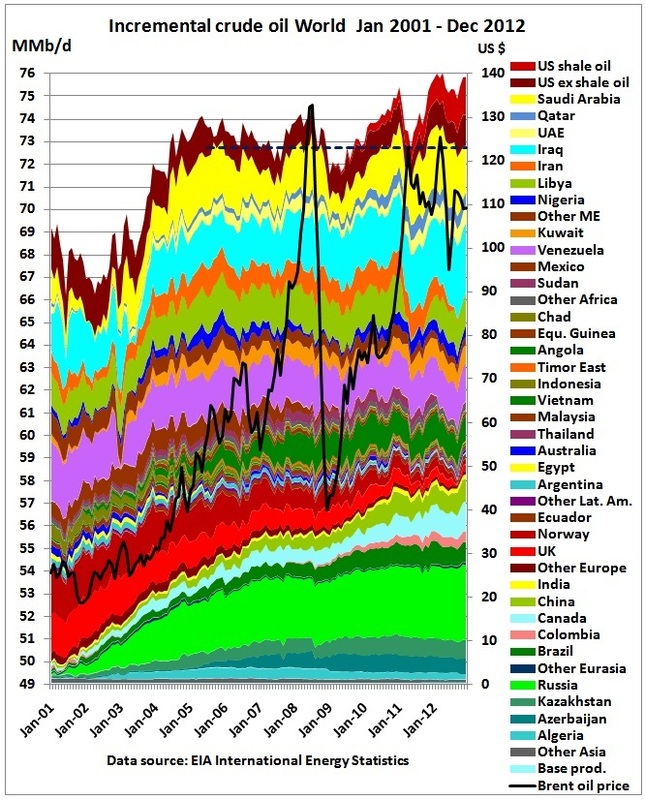 Global crude production in 2012 reached a new annual peak at 75.5 mb/d (2005: 73.6 mb/d) but the above graph shows that this growth was mainly coming from the US, in particular from shale oil (tight oil). 91% of global crude production remained on a bumpy production plateau, with an average of 73.7 mb/d, only marginally higher than 2005 production. Let’s have a look at some players with impacts on global supplies. Out of a total of 7.5 mb/d crude production which grew from 2001, Russia contributed 3 mb/d, Saudi Arabia 1.8 mb/d, Canada (syn-crude from tar sands) 1.1 mb/d, US 0.7 mb/d, Iraq 0.6 mb/d, Iran -0.4 mb/d and the rest 0.6 mb/d. This rest peaked in 2005/2006 and declined by 1.6 mb/d since then. Saudi production shows 3 peaks. 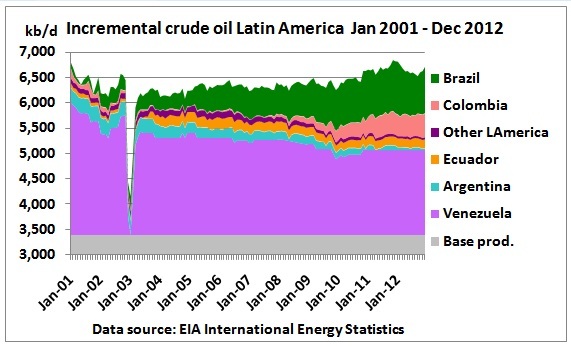 The 1st peak was caused by oil-geological decline in 2006/07. In 2008, the Oilympic peak before and during the Games in China. And 3rdly, a ramp up of production from upgrades in existing fields (AFK, Shaybah, Khurais). 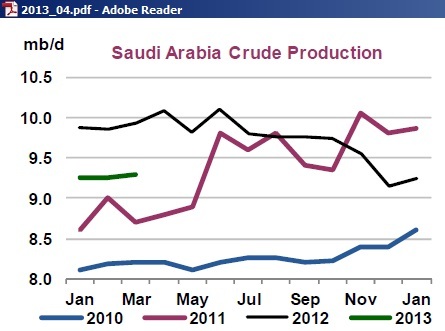 The 2H12 drop in Saudi production could not be satisfactorily explained yet by the IEA monthly oil market reports. The IEA tried to blame demand drop off after the seasonal summer surge direct burn in power plants of 0.5 mb/d but this did not show in the preceding years. 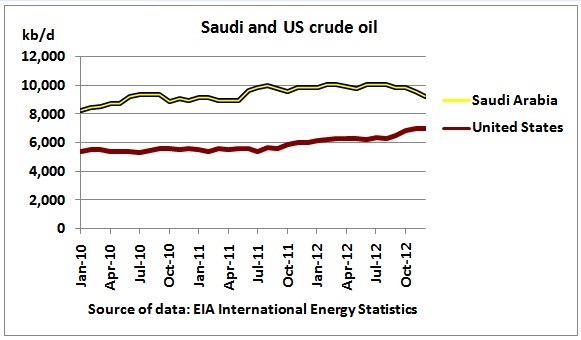 Since July 2012 US crude production increased by 650 kb/d, Saudi production dropped by 780 kb/d. 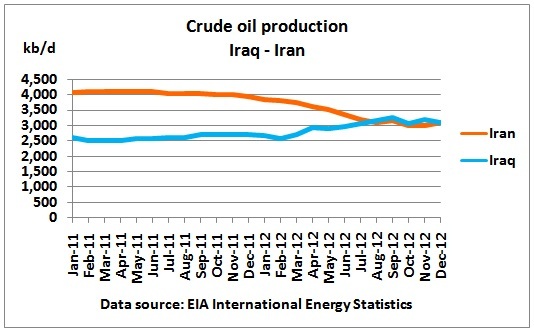 In 2011/12, Iraq’s increase was more than cancelled out by Iran’s decline as a result of sanctions. Iran’s nuclear program and military posturing has to be seen – at least in part – as a response to the 2003 invasion of Iraq. The combined decline of these 2 countries is therefore a blow-back of this ill-conceived oil war. Without Russia’s oil, the world would be in a deep oil crisis. Azerbaijan and Kazachstan seem to have peaked. In 2008, at an Ethanol conference in Sydney’s convention centre in Darling Harbour, I showed Russia’s oil peak to then NSW Premier Morris Iemma. Since then, Russia was able to increase production by 1 mb/d. The additional time was wasted. China can muster production surges up to 0.5 mb/d. The world will not see one drop of this oil. Venezuela’s crude production data are suspiciously unchanged over many months, suggesting these are rough estimates. Note that in these incremental graphs, the size of the stacked areas is proportional to the changes since Jan 2001, not the total production. And changes matter. No sooner had oil production resumed in Libya (although not to previous levels) did a conflict between South Sudan and Sudan erupt over oil, leading to a shut-down of South Sudanese oil production. 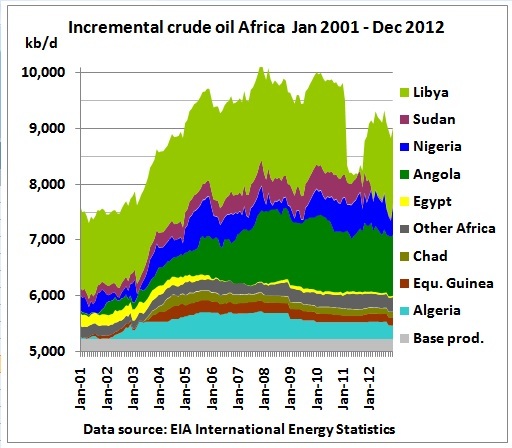 African crude oil production has clearly peaked. Conclusion: Yes, so far we had an annual peak in 2012. Many are happy to wait either for another peak year or for 5 years to prove the past peak was indeed the last. But this does not help 91% of global crude supplies where peak oil is alive since 2005, as high oil prices play havoc in economies and the financial system.